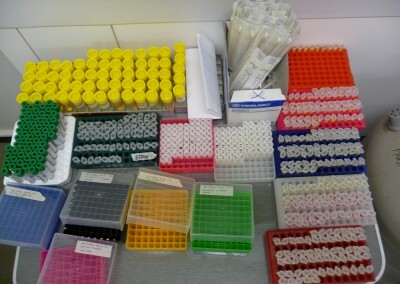 In general terms performing the necropsy in a laboratory environment should ensure high quality of samples and allows the staff to work in comfortable conditions. By facilitating compliance with hygiene and safety regulations, a necropsy performed in the laboratory should also minimize the risk of contamination both into the establishment or out with. 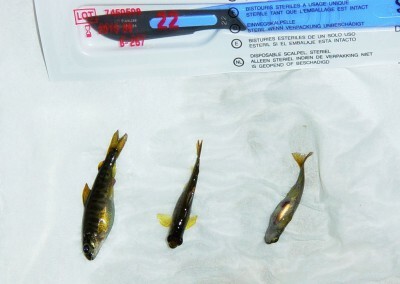 Designated areas for fish necropsy can be organised differently in different laboratories, but what is important is to follow the basic principle of an adequate separation of “clean areas” (e.g. samples reception with not direct contact risk) from “dirty areas” (e.g. 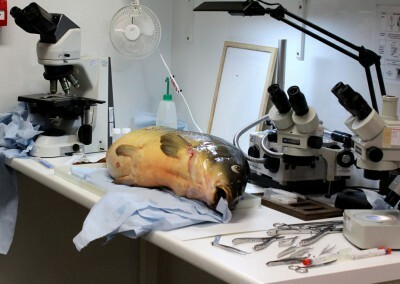 manipulation of sub-samples, necropsy room and removal of biological waste). 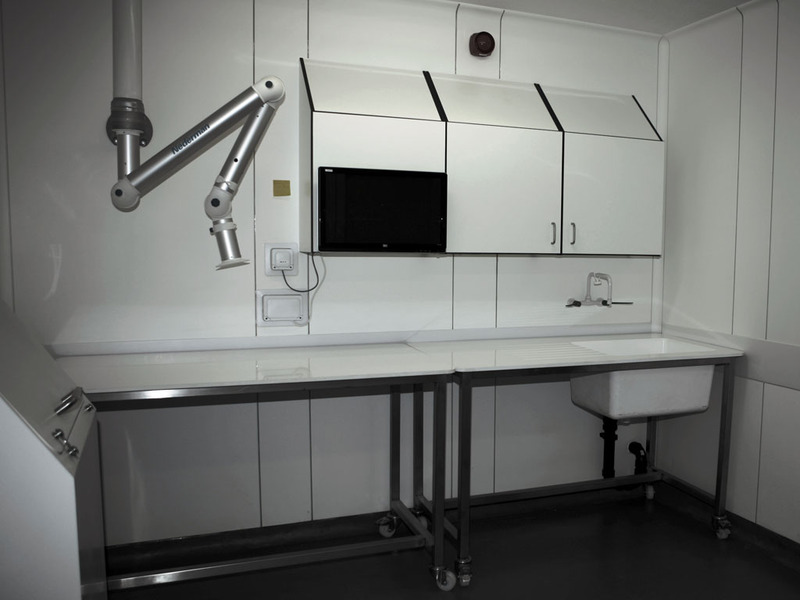 The necropsy room or designated area will require adequate lighting and ventilation, water, electricity and/or gas supplies, walls and working surfaces readily disinfectable, and ideally, a system of focal point -targeted flow/air extraction to prevent the staff inhaling vapour from fixatives or any potentially toxic substances. If possible, access points to computer systems and internet should be supplied as this will facilitate the immediate data recording (filling forms) allowing remote access from outside the necropsy room. This avoids the need of transfer of spreadsheets or note books which may have been in contact with potentially contaminated material outside the necropsy room. Or very small fish (FHI). Currently, a number of items can be sourced as disposables, which is especially suitable for preventing contamination between samples, cases or workstations; the disadvantage can be the cost. Stainless steel tools are widely used and will remain a standard choice for their quality, durability and resistance to temperature and / or corrosive substances, making them readily disinfectable. The list above is normally enriched with a set of other tools and elements particularly appropriate for different requirements (e.g. Pasteur pipettes, arc saws for big size specimens decapitation). Some people opt to work directly on top surfaces but a washable and easy to disinfect tray is also very useful (stainless steel or plastic). Other disposable items and accessories required include gloves, lab coats, plastic bags, grids and paper towels. For sample collection other tools and consumables are normally required including slide and cover glass, containers of different type and sizes (Universals, Eppendorf like tubes, Petri dishes), syringes, needles, disinfectant wipes, labelling elements, etc.. In addition, different anaesthetics, disinfectants and fixatives are normally required. The use of appropriate fixatives and refrigeration according to requirements, help to maintain the sample quality and delay the onset of post-mortem changes. Nevertheless, some samples or analysis may become compromised and their further processing will depend on evaluation of suitability. 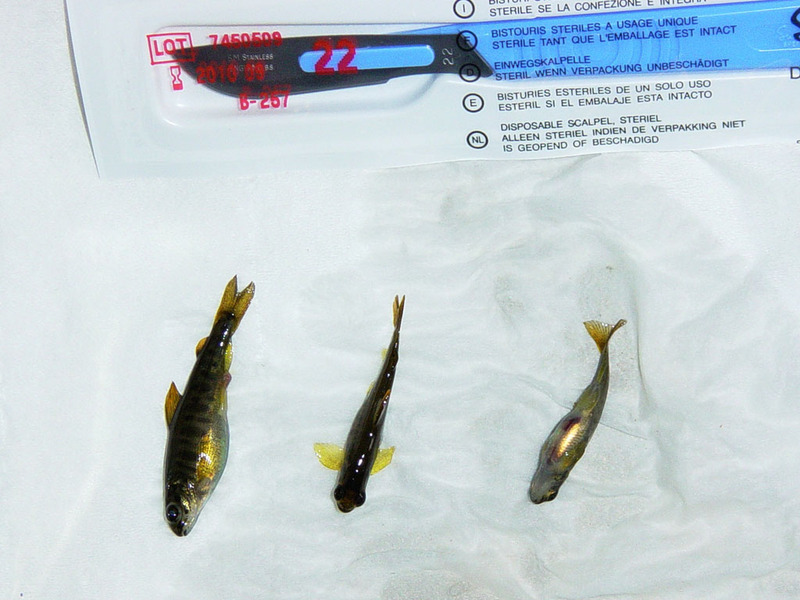 If the minimum requirements or trained personnel on site are not available, the best option will be the transport of live specimens to the laboratory. A portable kit for measurement of water chemical or biological parameters can be especially useful for necropsies performed in remote areas, where relevant data is not available (wild fish), or cannot be supplied by the fish farmer. To perform necropsies out with the laboratory, the best advice is simply to try to recreate the working environment of a laboratory as closely as possible. In addition to obtaining the essential dissection and sampling tools, try to create a relatively isolated and properly illuminated area to perform the work and have readily available iceboxes and / or suitable containers with cooling elements to accommodate the samples for transport to the laboratory. 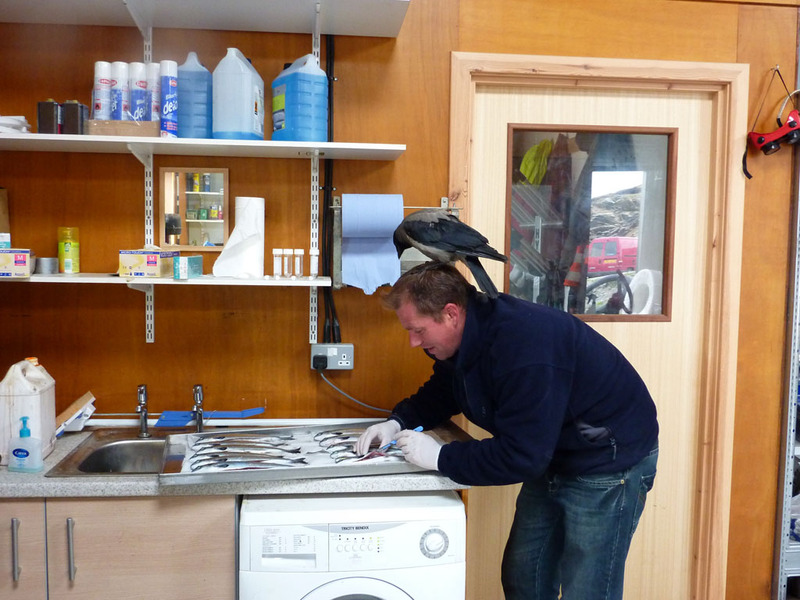 Always disinfect the premises and all equipment and materials used. In all cases it is essential to ensure the correct disposal of all waste material, especially biological, by following the established standard procedures. Sometimes this may involve transfer of certain waste back to the laboratory to ensure its proper disposal. The laboratory In general terms the performance of the necropsy in the laboratory environment should ensure the maintenance of the sample quality, minimizing the risk of contamination in or out of the establishment, while ensuring compliance with hygiene and safety regulations and allowing staff to work in comfortable conditions. Laboratories have resolved differently however adequately, their designated areas for fish necropsy, the basic principle being an adequate separation of “clean” areas (e.g. samples reception with not direct contact risk) from “dirty areas” (e.g. manipulation of sub-samples, necropsy room, biological waste, etc.). 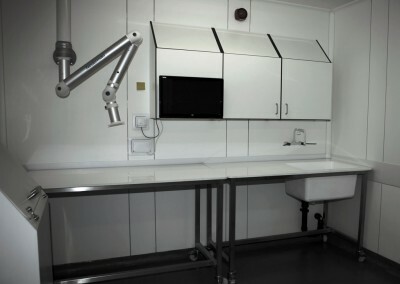 The necropsy room or designed area will require adequate lighting and ventilation, water, electricity and/or gas supplies, walls and working surfaces readily disinfectable, and ideally, a system of focal point -targeted flow/air extraction to prevent the staff inhaling vapours from fixative or any potentially toxic substances. If possible, access points to computer systems and internet will facilitate the immediate data recording (filling forms) allowing remote access from outside the necropsy room. This avoids the need of transfer of spreadsheets or note books which may have been in contact with potentially contaminated material outside the necropsy room. Necropsy room fitted with fume extraction and computer systems. 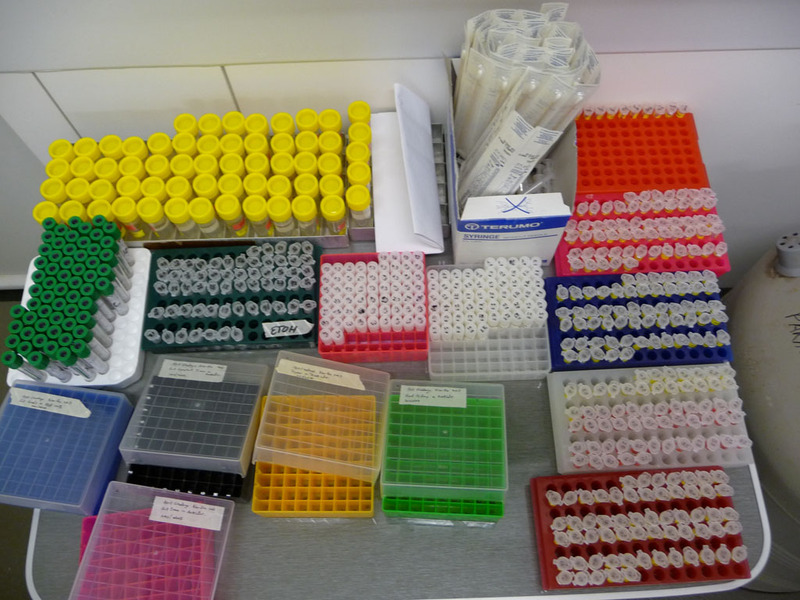 Material prepared for large sampling procedures. Currently, a number of disposable items can be sourded, especially suitable to prevent contamination between samples, cases, or workstations; the disadvantage can be the cost. Stainless steel tools are widely used and will remain a choice for its quality, durability and resistance to temperature and / or corrosive substances, making them readily disinfectable. The list above is normally enriched with a set of other tools or elements particularly appropriate for different requirements, e.g. 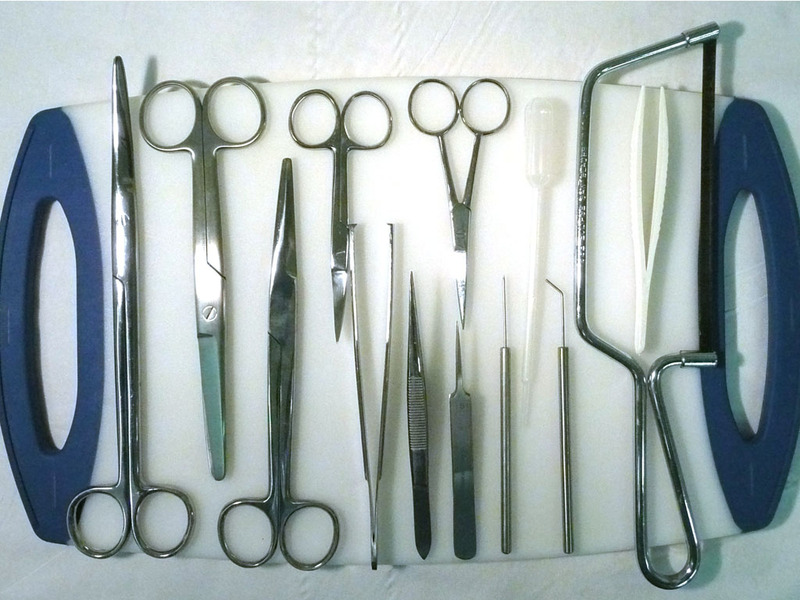 pipettes or arc saws, and a washable and easy to disinfect tray is also very useful (stainless steel or plastic). Several disposable items and accessories are also required, including gloves, lab coats plastic bags, grids and paper towels. 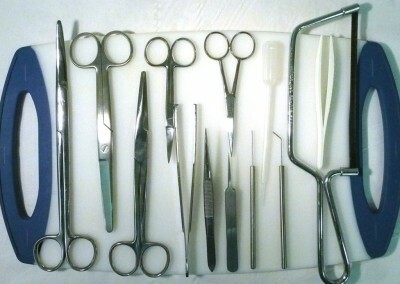 For tissue sampling, other elements are normally required and include slide and cover glass, different type and sizes of containers (Universals, Eppendorf like tubes, Petri dishes), syringes, needles, disinfectant wipes, labelling elements, etc..
To perform necropsies out with the laboratory a good comprehensive advice is simply to head for recreating as best as possible the working environment of a laboratory!. In addition to the essential dissection and sampling tools, try to generate a relatively isolated and properly illuminated area to perform the work and have readily available iceboxes and / or suitable containers with cooling elements to accommodate the samples for transport to the laboratory. Field sampling requires to be adapatable. 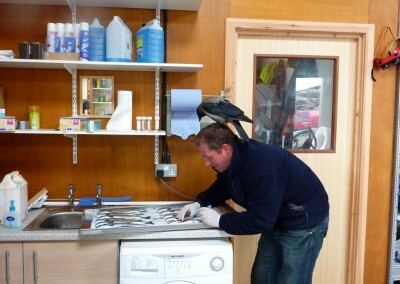 Always disinfect the premises and all equipment and materials used. In all cases is essential the correct disposal of all waste material – especially biological- by following the established standards procedures. Sometimes this may involve the transfer of certain waste back to the laboratory to ensure its proper disposal.